Oh my I have waited to tackle this project. My desk was in need of an overhaul. I have been putting this off because the weather has been so beautiful here that I have been outside racking up my lawn. My lawn and garden are in need of my attention but I am trying to stay on track and finish the inside first. So here we are, desk organization day. I have already walked the dogs twice, gone to meetings and drafted a photo shoot timeline all to procrastinate the desk/office organization. Before starting this project I went to Staples and purchased everything I could find by Martha Stewart to organize my life. My thought process behind buying Martha’s line was that she seems to have her act together and I would like to be more like her. In fact I would love it, a house in Maine and estate in New York lots of helpers and wonderful dogs…and the money to pay people to keep your life orderly…sign me up! If you are reading this blog you are stuck with my take on organization…make what you have better, the best is not only not necessary, but also not in my budget! Before starting you will need a vacuum, cleaning supplies, trash bag, bulletin boards and containers to organize your stuff/life with. I vacuum the room before starting the actual organizing, more procrastination! 1ST step: you need to do is clean off your desk. I move items on to the floor and stack them in piles or groups. Bills, magazines, kids’ paper work, etc. 2nd step: you need to wash off your desk, filing cabinets, bookcases etc. When doing your bookcase read spring cleaning day one for ideas. 3rd step: Look at your empty surfaces and enjoy it while you can! Add the boxes, containers, file holders etc. 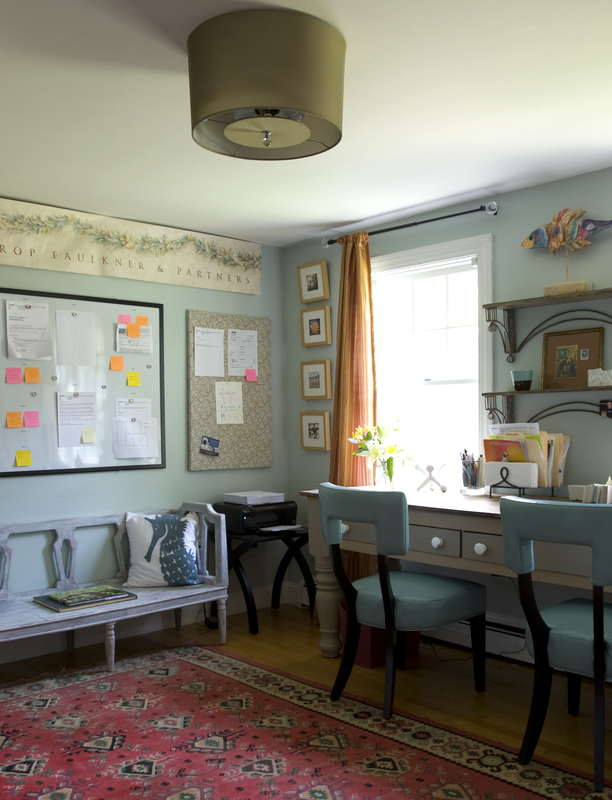 Look to your walls for space to help you get organized. Could you hang bulletin boards, hanging file holders, dry erase boards and shelving to help you in your quest for order? Shelving helps to free up valuable desk space…in turn making you more productive…or so they tell me. I will let you know how this all pans out. 4th Step: Take a look at your space; what do you need it to do? Is it set up to help you do whatever you need to do there better than it was before? Can you put everything you have removed from the desk area back into a designated spot or container? Have you labeled the boxes/containers to help you stay organized and to help others find things easily if you share your work space? As a designer I have lots of magazine pages that are given to me by clients. I use bulletin boards and magnetic boards and label them by job. Each job might also have a hanging folder and a box for samples. This helps me both visually and physically to keep each job on task. 5th Step: Weed out the items you do not need. Make up boxes to store tax information, children’s records & art etc, and other business that you need for reference but is not current.